Reading a print magazine, bought from a physical book store is slowly moving out of the scene. Keeping pace with the change in generations, it is time to introduce digital publishing to your content strategy. This will reduce the time spent in visiting a magazine store to buy the latest issue, facilitate the readers to know reviews, ratings, and a brief magazine introduction, from the comfort of their home. Thus, convenience, portability, instant presence, and ease of use are some of the advantages of digital magazines, that are beneficial in both distributing and consuming the content. Adobe InDesign is one such application offered by Adobe, which helps in designing a digital layout for magazines, flyers, books, etc. Adding value to these creations, the mag+ platform offers the capability to add interactivity with the InDesign plugin and publish these magazines to the app stores of choice. Say, if someone wants to publish a brochure, interactivity can be added using videos, popups, etc. so as to explain features just in seconds rather than explaining over a significant number of pages. Once published, the audience can start reading just by downloading the native application on their mobile devices. mag+ is a complete digital publishing platform that assists in creating unique digital content, building branded apps, and distributing them to the app marketplaces. mag+ creations start in the Adobe InDesign plugin. This provides an opportunity to unleash your creativity by creating magazines, brochures, posters, catalogs, books, and eBook. mag+ digital publishing suite makes sure to fulfill the requirements of graphic designers, magazine publishers, content creators, production artists, and other businesses, irrespective of their sizes. mag+ helps in publishing the designed content layouts, including text, image, video, and other engaging features as branded mobile applications. The mag+ plugin provides the templates for the basic design of the app wherein one can modify to match their business needs. Or else, choose to start from scratch and design on their own. Users can design the digital templates according to their imagination and include interactive features like images, videos, popups, slideshows, or text. Chosen features are arranged as per the requirement and the extended pages can be scrolled down with no need to constantly turn the pages. This enhances user experience and content readability. Post creation, export your designs to the production tool where you can assemble created verticals and get a feel of your app. The mag+ reviewer app helps instantly preview the designs in real life. This gives you a sense of your mobile app on real devices and allows you to tweak if there is any lag. Once pushed to publish portal, you can seamlessly convert your designs to a full-fledged application that can be submitted to the app stores and distributed to the millions of mobile phones and tablet devices across the world. This software helps you stay away from any coding requirements for creating or publishing the application. Also, a regular user of Adobe InDesign can simply use the mag+ plugin as it is intuitive and easy to use. All that is needed, is the content in the form of text or video or other content forms that you want to display in the layout. If the user still faces difficulty in designing the applications, 24*5 support is available to help with the making of the magazines or other publications. mag+ provides flexibility and full control over the content creation and distribution process. With mag+, impressive features can be added like multiple scrollable layers, pop-ups, slideshows, 360-degree rotation, etc. It is the digital-first design platform that helps in creating fully customizable content for mobile devices and easily add interactivity to the mobile canvas. The best feature of all is that the resulted application represents the brand directly in an engaging manner. Once the document is created and downloaded, it can be used even when the device is offline. The features of the mag+ are very simple and easy to understand and if any experienced graphic designer uses it, they can start working with the tools in a matter of minutes. Now, a great feature would be if you can view your application even before you publish just in case to check if there is any modification needed. Don’t worry, we’ve got it all covered. With the reviewer application of mag+ on the Google Play Store and iTunes Store, you get an idea of how the application will look after it’s published. This provides you with the chance to correct any mistakes or tweak your content to add more interactivity. With the mag+ plugin, the creativity extends its limit by providing a chance to add audios and videos to the digital content formats. Publishers can use sound effects on the pages to match with the theme of the page or the text that is written. The use of full-screen videos can be an amazing feature to include in digital magazines. Ability to add promising features distinguishes mag+ from every other plugin or tool for creating digital magazines and content publications. The tool also provides a feature where creators can customize the navigation bar or build the content with the navigation links. Suppose, a reader is reading a document and want to check a term explained therein, he can instantly navigate to that page with the help of a jump link. The tool is unique in all aspects when it is about creating an interactive document. It helps in adding elements like text, images, videos, or pops ups. Also, the tool provides the animation feature for the headlines with the existing GIF support or freedom to build your own simple animations for the content. There is yet another interesting feature where a user can use pinch zoom to zoom into the images or pinch out to zoom out from the images. It also lets you create text that scrolls in its place or include a large image that can be scrolled behind the fixed text. Before designing the application, it lets users decide which devices they wish to design for or how they want the orientation to be. The orientation can be adjusted by the device or it can be kept fixed as per the designer’s choice. If you wish to convert a PDF into the interactive digital magazine or any other digital creation of your choice, use the inbuilt converter and all you have to do is just add the interactive features and the PDF document is converted into an engaging digital magazine. mag+ is different from the other tools available online in many aspects. 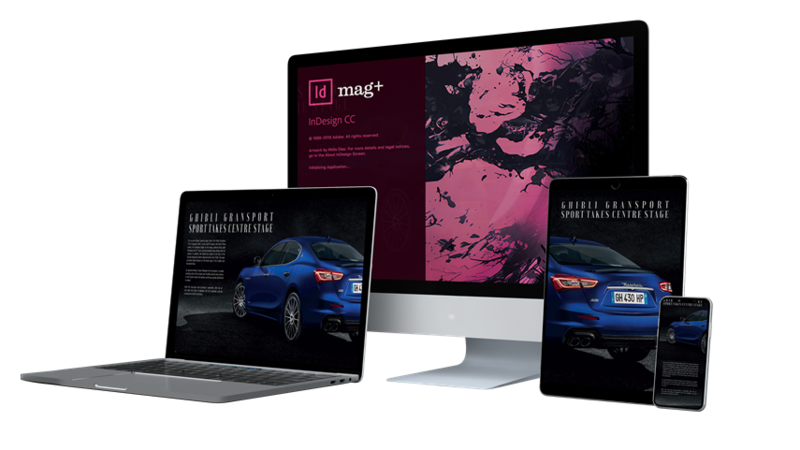 Most of the tools use their own platform whereas mag+ is providing a simple tool that integrates with the Adobe InDesign. With the application, Adobe InDesign users can start with a template, enrich using interactive features and customize according to your needs. Publish branded applications, named after your business. It helps in making your application brand, the brand it is meant to be. With just a few clicks, the application is developed. No hassle, no coding, just a few images, videos and audios and voila you have your application built up. If one wants, a Live page URL can be added, which will link the whole online page in the application. And this is not where the tool stops. It will provide you the full control of the application and if you want you can update or remove the URL later on and you will never need to update it again, just to update the URL of the link. It also provides you with the library in the application where you want some of the premium content locked for your premium subscribers, or users. You can ask them to log in to view your content which can provide you with the database of your clients who are interested in your application. Winning mag+ applications can be submitted to the Google Play Store, Apple App Store, Windows Store, or Android Kindle Store. It’s your choice to distribute your applications for free or at some cost. It allows the creator to modify the content if needed without affecting the presence of an app in the app stores. mag+ offers additional services to keep the existing app users engaged and attract the new ones. After your application is published, mag+ extends its support to assist all along the app journey. There’s an inbuilt push notification service which helps in sending the messages to the application users. You can also send messages to a group of people with different personas. This way, publishers can connect with the subscribers and inform them about notifications, new issue update, benefits, etc. Other than that, for the subscribers who rarely visit the app, notification can be sent about the new content added in the application. This will remind the users to engage with the application and maintaining constant communication with the readers. The application built also have an inbuilt space where app creators can add promotions to monetize their apps or provide content from any website or pitch for a survey right there. You can also share the content on social media directly from the application. These spaces can also be used for the third party in-app advertising. mag+ not just cares about your creative project requirements and publication, it also creates an opportunity to generate revenue from the applications. The capable mag+ platform helps you build branded native application and distribute it to the Apple App Store, Google Play Store, Windows Store, and Amazon Kindle Store. Since it is submitted through your developer accounts on respective marketplaces, any purchases made in the application will go directly to your accounts. It offers the service for selling subscriptions and managing them with the analytics services from Flurry, Oplytic, Localytics, etc. These analytics platforms are partners of mag+ and assist in generating the return on investments in the application. After innovative tools and untiring support, if you still struggle understanding how to get creative, implement features, tutorial videos are provided on the website. You can learn basic workflow from installing the plugin, designing the documents, installing reviewer application, to publishing the application. These videos offer solutions and tricks to avoid general mistakes and streamline your workflow. Also, mag+ offers the application update services, where experienced mag+ professionals update your apps if you need to update your app to the latest OS version or add new features to enhance the user experience. Post updating, the app is sent for your approval and then successfully published to the marketplace of your choice. Pioneering the industry and trusted by numerous industries, big, small, or medium, mag+ is associated with bigger brands like Unilever, Harvard Business School, Schneider Electric, Volvo, and many more. With such a great brand market and proven competitiveness, mag+ leads the digital publishing industry. With reasonably priced licenses and unmatched promising features, thought leaders and influencers in the industry highly recommend mag+.